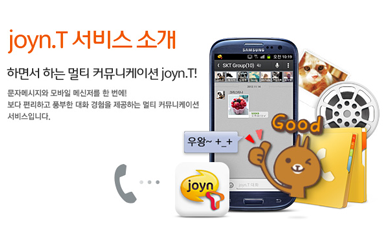 SK Telecom officially launched "joyn.T" -- an all-IP-based RCS (Rich Communication Suite) service under GSMA's 'joyn' brand. The service allows customers to use many different types of communication services, including Rich Call, Rich Messaging and Rich Phonebook, in an integrated manner regardless of network and device. The SKTel service is supported via an app available for 22 different types of Android OS 2.3 (Gingerbread) smartphone. A joyn.T application for the Apple iOS is expected shortly. SKTel said joyn.T will also add features based on the RCS standards, such as HD Voice (VoLTE), The carrier said it will integrate all its future communications services into joyn.T. It also looks forward to support joyn roaming with other carriers across the globe. Wi Eui- Seok, Senior Vice President and Head of Product Planning Office of SK Telecom said, "SK Telecom is delighted to be presenting joyn.T, an integrated communication service designed to satisfy customers' needs and interests, thereby enriching their communication experience. Building on its innovative features like instant messaging-SMS link, we plan to add more features to shape Joyn.T into an attractive communication channel that can be enjoyed by customers irrespective of their carrier or device." In December, SK Telecom reported a daily average of 60,000 new LTE enrollments, representing over 50 percent growth compared to the previous month. LTE subscribers surpassed 7 million as of December 12, 2012, thereby achieving the end of year target for LTE subscribers. The company's LTE footprint covers 99 percent of South Korea's population. For comparison, it took SK Telecom two years and four months to acquire 7 million 3G WCDMA subscribers since commercializing the service in May 2006. In August 2012, SK Telecom launched its HD VoLTE service. 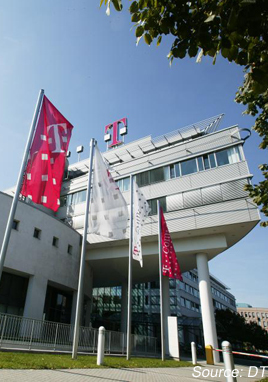 Telekom’s subsidiary T-Systems aims to achieve annual revenue of roughly one billion euros, or one seventh of its total revenue, with its cloud business in 2015. T-Systems had cloud revenue of about 400 million euros in 2012. T-Systems cited a number of hosting and cloud service contracts signed in recent months, including deals with Shell, BP and the Presbyterian health care system in the United States, the Swiss group Georg Fische, Spain's SEAT, and British American Tobacco (BAT). "The trend toward cloud solutions can be seen even today from major orders placed by corporations," said Telekom Board member and T-Systems CEO Reinhard Clemens. In December 2012, T-Systems announced plans to simplify its organizational structure from four business areas to two: Sales and Delivery. T-Systems said it is taking this approach to improve agility in helping its enterprise customers adapt for the cloud. In October 2012, T-Systems began construction of Germany's largest data center -- a massive facility that will be built on a surface area the size of approximately 30 soccer fields (i.e., 150,000m2) in Biere, Saxony-Anhalt. The new facility, which will be the 90th data center operated by T-Systems , will be a twin of another data center already running in Magdeburg. The new construction in Biere will form a "TwinCore" -- in the event of any disruption, the twin facility can immediately take over. 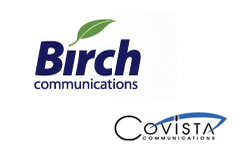 Birch Communications, which provides managed communications and information technology services to SMBs in 38 states across the U.S., agreed to acquire select customer and network assets from Covista Communications. Financial terms were not disclosed. Covista, which is currently traded under the symbol CVST.PK, is a facilities-based telecommunications service provider that serves business, wholesale and residential customers in 48 states. "Covista's base of high-quality customers are primarily located in several southeastern, southwestern and northeastern states, and fit extremely well into the current Birch footprint. In addition, Covista's Metaswitch-based facilities network, which has switching centers in Tennessee, New York City and Los Angeles, is complementary to our current service footprint while also adding some new markets," said Vincent M. Oddo, Birch President and CEO. "This acquisition will strengthen the breadth and scope of the Birch IP-Network and will further enhance our hosted PBX, SIP trunking and wholesale service offerings." Birch has acquired 17 companies since 2006. Berkshire Partners, a Boston-based investment firm, announced plans to acquire both Lightower Fiber Networks and Sidera Networks and merge the companies into a single telecom operator. The two transactions are valued at over $2 billion. The companies named Rob Shanahan, Lightower’s current President and CEO, to be the CEO of the new company. Lightower own and operates over 6,600 fiber route miles extending from New England, to eastern New York State, New Jersey, Long Island and New York City. The fiber footprint provides access to over 3,500 service locations. Investors in Lightower Fiber Networks include M/C Partners, Pamlico Capital and Ridgemont Equity Partners. 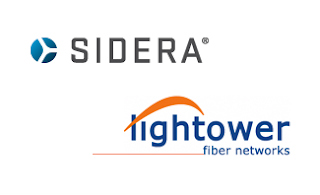 Sidera's fiber footprint spans more than 13,500 route miles and includes metro networks in Boston, Chicago, London, Long Island, New York City, Philadelphia, Toronto, and Washington D.C. It has over 3,000 on-net locations. Investors in Sidera Networks ABRY Partners and Spectrum Equity Investors. CTIA-The Wireless Association announced plans to consolidate its two mobile trade shows in the United States into a single "super" event in 2014. The first CTIA super mobile show, CTIA 2014, will take place Sept. 9, 10 & 11 at the Sands Expo Convention Center in Las Vegas, Nevada. 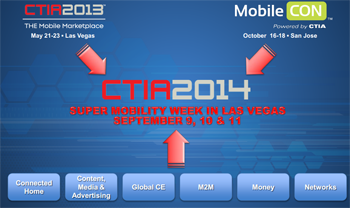 CTIA will continue to host CTIA 2013 and MobileCON 2013 separately while incorporating super show programs as a springboard to the changes in 2014. "The wireless industry is evolving rapidly and there is a need to have a show that centers on the entire global mobile ecosystem in a way that hasn't existed among the current shows, which is why CTIA 2014 will be unique. The mobile revolution is positively affecting nearly every industry, such as M2M, connected home, media and advertising, money and global consumer electronics, and CTIA 2014 will serve as a worthy platform to showcase those companies and individuals that are leading this charge and will be a valuable resource for anyone wanting to be a part of this innovative industry," said Rob Mesirow, CTIA Vice President and Show Director. "In addition, the timing of the 2014 show will deliver the perfect stage for companies to debut mobile consumer products and services for the annual holiday buying season." CTIA-The Wireless Association announced today its 2013 officers, who were elected by its 38-member board of directors, and who will serve a one-year term: Mary Dillon, President and CEO of U.S. Cellular, Chairperson; Dan Mead, President and CEO of Verizon Wireless, Vice Chairman; Angel Ruiz, President and CEO of Ericsson, Inc., Secretary; Bret Comolli, Chairman of Asurion, Treasurer; and Pat Riordan, President and CEO of Cellcom, Chairman Emeritus. In addition, CTIA welcomes five new members to the 2013 Executive Committee: Ron Smith, President of Bluegrass Cellular, Inc. (Small Carrier); F.J. Pollak, President and CEO of Tracfone Wireless, Inc (Midsized Carrier); Dan Inbar, Senior Vice President & General Manager, OEM of SanDisk Corporation (Other Supplier); John Sims, President of Sybase 365 (Other Supplier); Jeff Gordon, President and CEO of Syniverse Technologies (Other Supplier). "The wireless industry plays an important role in America's economic vitality and makes our personal and work lives better by improving how we interact from wireless technology in other sectors, such as healthcare, education, transportation and more. That's why the 'light regulatory touch' that has been in place for the industry since President Clinton's tenure is vital. By having these individuals provide their in-depth expertise and leadership to our executive committee, I am confident we will continue to be successful advocates for more critically-needed spectrum and for the 'light regulatory touch' so the U.S. remains the world's leader in wireless technology, services and products," said Steve Largent, President and CEO of CTIA. A jury in Pittsburgh awarded $1.169 billion to Carnegie Mellon University in a patent infringement case against Marvell Semiconductor. Carnegie Mellon University said case deals with fundamental technology for increasing the accuracy with which hard disk drive circuits read data from high speed magnetic disks. Patents covered by the lawsuit were awarded to Jose Moura, a professor in the University's Department of Electrical and Computer Engineering, and Aleksandar Kavcic, a former Ph.D. student of Moura who is now a professor of Electrical and Computer Engineering at the University of Hawaii. For its part, Marvell asserts that the two CMU patents claiming a specific technique related to read channel detector technology is not practiced by any Marvell chips. Furthermore, Marvell argues that "the theoretical methods described in these patents cannot practically be built in silicon even using the most advanced techniques available today, let alone with the technology available a decade ago." Ericsson will supply Etisalat Egypt with its latest RBS 6000 radio base stations to upgrade the operator's mobile infrastructure. Ericsson has been a long term supplier to Etisalat Egypt. Financial terms were not disclosed. Acacia Research Corporation announced the acquisition of certain 2G, 3G and 4G related patents from Nokia Siemens Networks. The patents related to Wireless Infrastructure and User Equipment Technology. Financial terms were not disclosed. Acacia also announced a separate licensing deal with NSN, along with separate settlement agreement with Siemens Industry covering a video analytics patent. LG Electronics (LG) is preparing to launch seven new models in its Google TV lineup at the 2013 International CES in Las Vegas. With Google TV, LG is aiming to redefine the user experience with a interface matched to its redesigned Magic Qwerty Remote, which combines a complete keyboard with the convenient benefits of the Magic Remote's point-and-click control. An updated Home Dashboard also adds to the user experience by offering convenient, streamlined access to premium video on-demand, such as HBO GO, content from YouTube and more apps. "LG is committed to providing diverse home entertainment options that offer the most satisfying user experience and the latest LG Smart TVs with Google TV do just that," said Havis Kwon, President and CEO of the LG Electronics Home Entertainment Company. 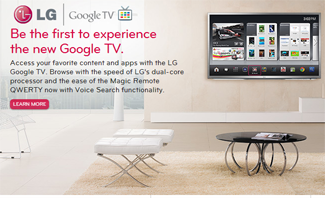 "They deliver a stellar user experience by merging the latest Google TV platform with LG's proven Smart TV technology. The result is a comprehensive system that is groundbreaking in its simplicity." The GA6400 series will be available in 42-, 47-, 50-, 55- and 60-inch class screen sizes.